안녕하세요. Team TAL에서 리깅을 담당하고 있는 9204입니다. 최근 검은사막 의상을 포팅해 배포 하던 중, 펄어비스로부터 메일을 받았습니다. 그에 따라 검은사막 의상의 배포를 중단하게 되었습니다. 검은 사막 의상은 더 이상 추가 포팅 또한 없을 예정입니다. 또한 저희가 만든 검은사막 관련 모드는 더 이상 업로드 하지 않아주시길 부탁드립니다. 그동안 저희 BDO Pack for Skyrim by Team TAL을 이용해 주신 유저 여러분들께 감사드립니다. I am in charge of rigging in Team TAL. 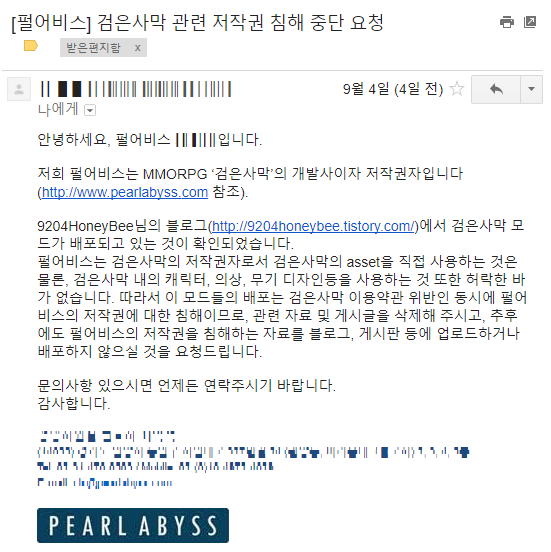 Recently, I received a mail from Pearl Abyss. As shown in the above, the Pearl Abyss asked for stop to upload. So we ended upload the BDO Pack. We don't have plan to porting other BDO Coustmes. Also, Please do not upload any mod related BDO that we crated. Thank you for your use of our BDO Pack for Skyrim by Team TAL. Next time, We'll see you with new modes. 저의 블로그에 오신것을 환영 합니다. 매일 좋은 글, 이미지, 사진으로 여러분을 기다리겠습니다. 9204 Bless RB0002 by Team..
9204 Bless MD0201 by Team..
9204 Bless HV0203 by Team..
9204 Bless HV0003 by Team..